A mysterious package attached to a bright red parachute set off a bomb scare on Tuesday — but the white Styrofoam box turned out to be a NASA experiment. A group of solar panel employees spotted the box when it floated to the ground at a solar panel field affiliated with the New Jersey Department of Environmental Protection, off of New Road in South Brunswick, around noon. When the employees approached the package, they discovered a handwritten message attached to the outside of it. "NASA Atmospheric Research Instrument NOT A BOMB! If found, please call [redacted]. If this lands near the President, we at NASA wish him a great round of golf." Not reassured by the message or the noise the package was making, employees reported the box to police. "We just had a package — I'm not making this up — parachute onto my site," a caller is heard saying in a recording. "It's a white Styrofoam package. It's making a weird noise." Police dispatched officers and a bomb squad to the area, evacuated the site and set up a perimeter, a South Brunswick detective said. Secret Service also investigated the package, according to the detective. They soon learned the box filled with wires really was part of a NASA experiment. The box "contained a weather balloon instrument that measures ozone," NASA said in a statement provided to News 4 New York. The parachute launched from a Rutgers University-owned site as part of a "Long Island Sound Tropospheric Ozone Study." "In this instance, a summer student employee, not affiliated with Rutgers, added extra text, in a misguided attempt to be lighthearted," NASA said. 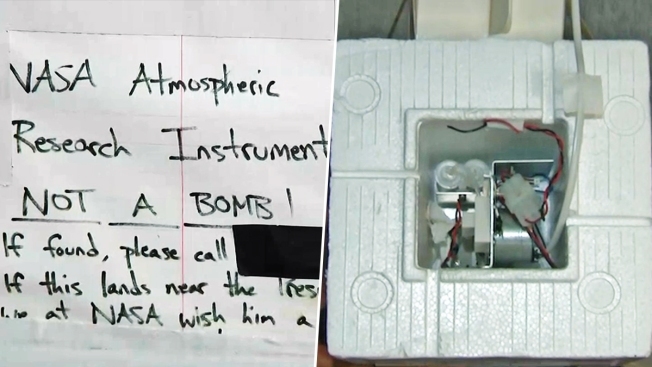 "The student who appended the note was removed from the project, and we are taking steps to standardize the labeling on these scientific instruments," NASA added. A total of six weather balloons were launched on Sunday, police said. So far, two of the balloons have been recovered — including the one found Tuesday and another one found in Readington Township, near President Donald Trump's Bedminster golf club. Police say anyone who finds one of the remaining four balloons has nothing to worry about. They don't have any plans to charge the NASA employee or the intern with a crime for releasing the balloons.